The meat of bugs, found only in the tail, has a medium-to-strong flavour. They can be bought as frozen meat or whole. Sold whole, sometimes live (and frozen whole, tails and as meat). Look for brightly coloured, firm, intact, lustrous shells, without any discolouration, particularly at joints, and a pleasant fresh sea smell. Wrap whole Bugs or meat in plastic wrap or place in an airtight container. Refrigerate for up to 3 days or freeze for up to 3 months below -18ºC. Average yield is 30%, the edible flesh is only in the tail and larger Bugs have a lower yield due to their head size. 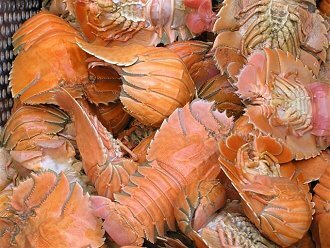 Has a medium-strong flavour (more ‘fishy’ than Moreton Bay Bugs), low oiliness and dry, firm flesh. To remove meat from shells, either split Bug lengthwise, or, to keep meat in one piece, remove head, turn tail over and cut down either side of the tail using kitchen scissors, peel underside of tail back and remove meat. Do not recook cooked Bugs, eat cold in salads or with a dipping sauce. The most humane, and easiest, method of killing any crustacean is to chill it in the freezer for about 45 minutes until it becomes insensible (but not long enough to freeze it). Once chilled, it should be killed promptly by splitting in half or dropping into rapidly boiling water. See www.rspca.org.au for more details. Steam, poach, deep-fry, pan-fry, stir-fry, grill, barbecue. Excellent cold as part of a seafood platter. To BBQ, cut in half lengthwise and cook in the shell. The firm flesh holds together well in soups, curries and casseroles and can be cubed for kebabs.